Whenever I think about Ivanhoe, I think of my nephew Will. Will has many credentials: he knows every country and capital in the world; he’s read every issue of National Geographic, he’s a great rugby player, he’s been to 85% of theart museums in the world; he speaks Farsi, and he’s taken a solo trip to Iran. Some day Will will give me a guided tour through the best museums in NYC. That Art History degree needs to be used occasionally. But I digress. 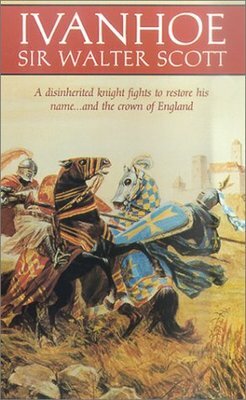 Will voluntarily picked up Ivanhoe and read it when he was in the fifth grade. And he understood it!! Move over, Will. Whenever I think of IvanhoeI now think of this review, written by my friend JT (Btolly‘s daughter) for a collegeclass. I begged her to let me post it. She graciously agreed, sweet girl! While I don’t share her scorn for this book, her ferocity is entertaining. Here is a book with a weak hero, a dead boring plot line and enough smarm to cover all other literary works of the 19th century. What was Sir Walter Scott thinking? Listen to the eloquence: “Alas, fair Rowena,”returned De Bracey “you are in the presence of your captive, not your jailer.” One might just as well read a Harlequin Romance and get the same story. It is sickening to the stomach. The whole book is a grease slick for the characters to ooze through with continual dialogs of unimaginative, unoriginal, doe-eyed, pansy-pantsed love speeches. Scott’s desperate attempts to save this “classic” is to throw in the ever controversial anti-semitism twist. But, alas, it works too well. Rebecca far outshines Rowena as a woman of substance, not fluff. If Ivanhoe was at all a real man’s man, he would go for tying the knot around Rebecca and not his lance. Hmmmmm…so THIS is what you two were murmuring about the other day…. “JT”, I still like the story. PS How many nieces/nephews do you have? Lots, I’ll bet. After reading Ivanhoe, my old, bedraggled edition had some commentary in the back of the book. I learned the story, which I had just enjoyed as a story, had many detractors and critics. There were several stories that used the idea of Rebecca’s worthiness in the plot line. In one, Ivanhoe abandons Rowena and runs after Rebecca. Keep up the good work MissTolly!